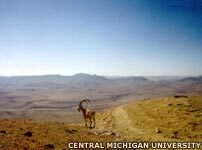 Ancient cave formations found in Israel provided the first concrete evidence that climate change allowed early humans to migrate out of Africa, according to researchers in 2007. A team of Israeli scientists studied stalactites and stalagmites, or speleothems, which had been found in five caves deep in the Negev Desert in southern Israel. They found that the growth patterns of the formations, which only develop in the presence of rain water, revealed a major cluster of unusually rainy periods beginning some 140,000 years ago. The rainy spells matched the period which saw the first modern human settlements in the Middle East. The scientists found that the period of enhanced rainfall which allowed the growth of speleothems occurred roughly between 140,000 to 110,000 years ago, with its height being 130,000 to 125,000 years ago. These dates correspond with modern human settlements which have been found slightly farther north in Israel's Carmel region and near Nazareth. Archaeological evidence has dated those sites to about 100,000 to 130,000 years ago. The wet periods formed what, essentially, were climatic windows that allowed migration north through the Sahara and up into Asia via a 'land bridge' on the Sinai Peninsula. The desert began to shrink both from the south and also from the north. The entire Sahara turned into something much, much smaller, and the desert barrier out of Africa was much less significant. The researchers analysed the cave deposits using high-precision spectrometry to measure their periods of growth. According to the Israeli team, the wet seasons reflected in the formations most likely helped ancient humans to pass through the otherwise arid region. These monsoon rains strengthened the Nile's flow, forming a northbound 'highway'. The climate along the shoreline of the Red Sea was also much less extreme during this period, and archaeologists have found evidence of migration along the coasts. 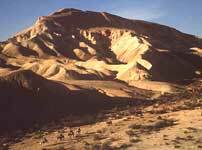 It is reasonable to see a connection between a wet period along the Sinai-Negev land bridge and the appearance of early modern man for the first time outside of Africa. Experts have been examining the influence of climate on human migration and evolution for years. But, according to the team behind the work, this was the first time that researchers had managed to turn up hard evidence. This evidence was claimed to fit within a network of other information on the migration of modern humans from Africa to Asia. Emory University anthropologist John Kingston, who was not involved in the study, agreed that the new find provided important physical clues to the history of early human migration. The connection between the rainy spells seen in the cave formations and the existing archaeological evidence in Carmel and Nazareth was also reasonable, according to Kingston. The use of speleothems to map climates was becoming increasingly popular at the time. What speleothems have that nothing else has is resolution, thereby providing a good terrestrial indicator. Not only can one get the environmental information but it could also be linked to dates as well, and that was the key benefit here. The research team also included Hebrew University's Alan Matthews and GSI's Ludwik Halicz. Their findings were published in the journal, Geology. The comfortable corridor through the Sinai and Negev wilderness didn't last long, however, according to GSI's Miryam Bar-Matthews, who took part in the research. The work showed that those humans who moved northwards from Africa could not return. Immediately afterwards, the desert once again became a very harsh location, preventing any such return. Kingston agreed, but added that this was likely not the only period of comfortable passage through the northern Sahara. He advocated the likelihood that these corridors would have come and gone, meaning that although immediate return may have been out of the question, an eventual backwards flow would not have been. Indeed, even comparatively recently - around four thousand years ago - the Sahara was again a temperate grassland which witnessed human habitation. This is the first time there is both evidence and exact dating... on the migration of modern humans from Africa to Asia.